Typically when we speak of "orientation" within the sacred liturgy, we naturally turn to a consideration of how the priest and people are situated in relation to the altar -- most especially as traditionally expressed by the shared, common direction of the same. This focus isn't merely a matter of style of course, but rather a consideration of the practical and theological import of this liturgical expression -- not to mention its rootedness in our tradition. The theological aspects have been amply detailed by the likes of Cardinal Ratzinger and Fr. Uwe Michael Lang, touching on themes pertaining to the emphasis of meal versus sacrifice, on the priest as the point of focus and the problem of the community as a self-enclosed circle versus a divine focus and orientation wherein the community gathers to worship God, led by the priest who acts in persona Christi. 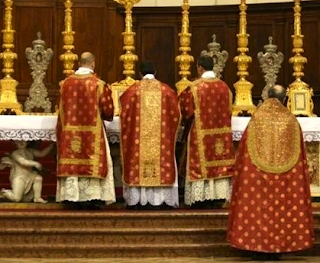 It is this matter of how ad orientem liturgicum is helpful to priest and faithful as a way of 'orienting' us toward God and giving a Godward focus to the sacred liturgy that interests me for our purposes here and now. I began by saying that this is usually what we think of when we speak about "orientation" and, to be clear, this particular matter is indeed of the utmost importance. But what I wish to highlight is the fact that we can extend this to other aspects of the sacred liturgy as well. For example, good and appropriate sacred music (such as Gregorian chant or sacred polyphony for example) also has an "orienting" aspect. It too has the ability to orient us toward the divine and into an attitude and disposition of divine worship. Speaking personally, I am always struck by how the use of Gregorian and Gregorian-inspired propers, for instance, is very effective in setting forth the proper tone or 'spirit' of the liturgy, assisting in establishing a prayerful and worshipful disposition -- and one of the clearest manifestations of this, for me at least, can be experienced when the Introit is chanted at the beginning of the Mass, as compared to the use of some other styles of liturgical music popular today in the same place. And what we say here of sacred music, we can also say of the liturgical arts generally, whether it be the architecture of the church or the vestments used. Through their beauty, dignity and nobility, they likewise orient us and draw us through their beauty toward the the divine. In each of these instances -- and others as well -- each contribute in way similar to that which we see with regard to the orientation of the priest at the altar, orienting the sacred liturgy in their own capacity, influencing our own understanding of and approach to it. By the same token, when approached poorly, they tend to have the opposite affect: they are disorienting. Certainly the Church has made a point to speak to the importance these aspects of divine worship when she legislates and provides guidance around them. This raises a pertinent point around their importance and relevance. There may be different "styles" when it comes to our liturgical arts, but like the orientation of the priest at the altar, these are not merely questions of style and should not be reduced to such. Instead, approaching questions like sacred music, sacred architecture, sacred vestments, and seeking after proper, qualitative and beautiful expressions of the same is rather about setting into place that which not only befits the dignity of the sacred liturgy and the mysteries and realities contained therein, but it is also about that which orients us toward those same mysteries and realities, and ultimately toward the Lord.